Kyle Cummins has partnered up with Eberhardt/Zirzow Racing for a run at the full USAC AMSOIL National Sprint Car schedule in 2018. INDIANAPOLIS (December 5, 2017) – Princeton, Indiana driver Kyle Cummins and team owners Chuck Eberhardt and Fred Zirzow (EZR) have partnered up to take on the full 2018 USAC AMSOIL National Sprint Car season. Previously supplying cars and engines to Chad Boespflug in 2016 and 2017, EZR now offers the same arrangement for Cummins, who will not only handle driving duties but also day-to-day maintenance from the team’s headquarters in Princeton. Their immediate plans involve a full slate of United States Auto Club sprint car contests, plus an assortment of Midwest Sprint Car Series and local Indiana dates when their schedule allows. Tim Mason Re/Max Midwest Real Estate Group, AFCO Brakes, Pro Shocks, All Star Performance, Simpson Racing Products, Hoosier Tire, HRP, and Jason Keefer Racing. A self-employed machinist, recent newlywed, and 15-year veteran of the Indiana sprint car wars, Cummins is a 12-time winner in the Midwest Sprint Car Series, notching four season championships with the southern Indiana sanctioning body. Entering its fifth full sprint car campaign, EZR’s roots date back to September of 2013 when they won with Bryan Clauson in their initial Gas City, Indiana outing. Claiming a 2014 Kokomo Speedway championship with Clauson on the strength of two feature victories, they teamed with Tyler Courtney for 2015, hitting pay dirt at Plymouth while expanding their reach to USAC sprint car contests. After partnering with Chad Boespflug for the 2016 season, EZR’s initial USAC feature victory came rather quickly in May at Eldora Speedway. That was soon followed by five additional USAC conquests, two of them occurring in a $60,000 weekend sweep of the Rock and Roll Gold Cup at Badlands Motor Speedway. 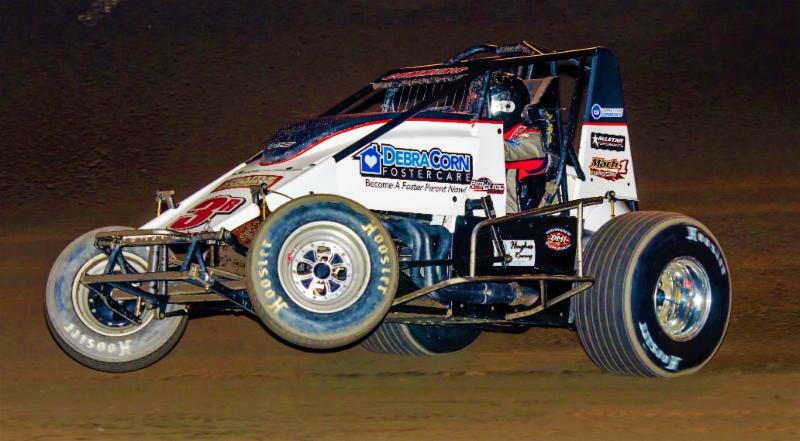 In 2017, EZR and Boespflug were paired with 11-time USAC sprint car champion Hoffman Auto Racing, taking top honors in a Bloomington USAC round and Brownstown’s No Way Out 40. Eberhardt and Zirzow first took notice of their new driver’s potential in February of 2016 when Cummins exited Florida with the USAC point lead. Opening night for this new combination will occur at Bubba Raceway Park in Ocala, Florida for the USAC AMSOIL National Sprint Car openers on February 15-16-17, 2018.